My dome has an under-bite at the front and will not pass the dollar test at the front. The rear felt is squashed down. There doesn't seem to be even spacing of the bands? I bought it new last September and it was set up this way from the dealer. Thoughts on aligning the dome would be appreciated. I just realigned mine. My XL was used when I got it and the hinge mechanism was bent. There are slotted holes in the hinge brackets that can be adjusted.I had to straighten the bent hinges and it takes patience but with trial and error you can realign the lid. I doubt your hinges are bent, my egg was not loved well in it's previous life. It works like new now. 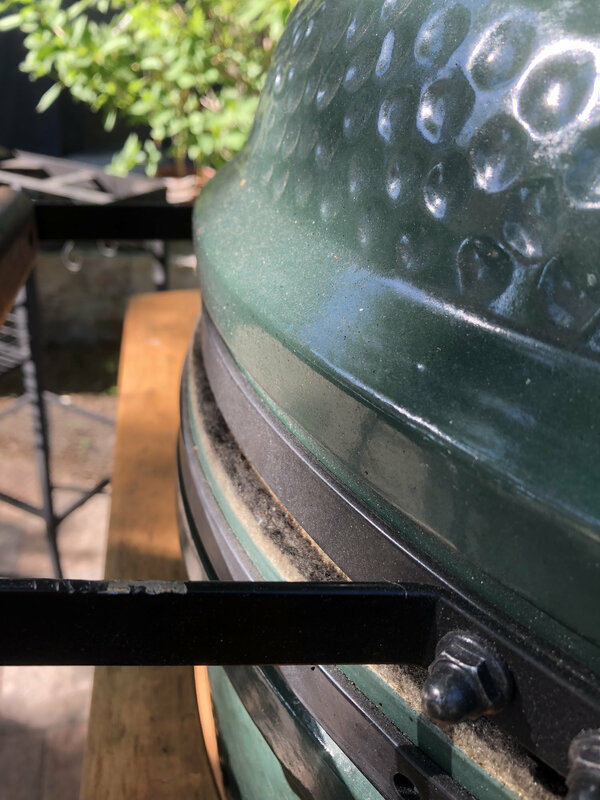 I had the same problem... adjusted it a dozen times, I think a blown gasket in the rear heated the band bracket assembly, then when lifting the lid (while it was still hot) the bands tweaked and settled back. 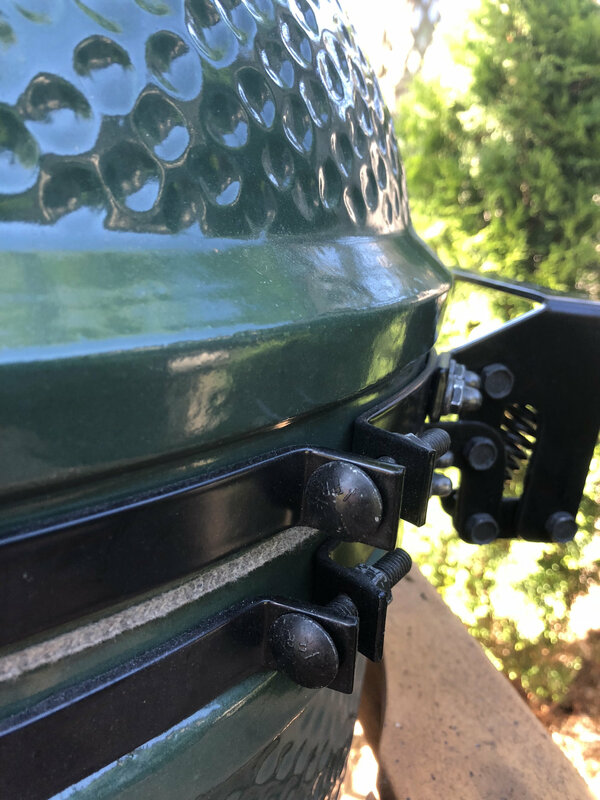 BGE replaced them for me under warranty with a new band assembly, the new assembly does not open as far but works great. 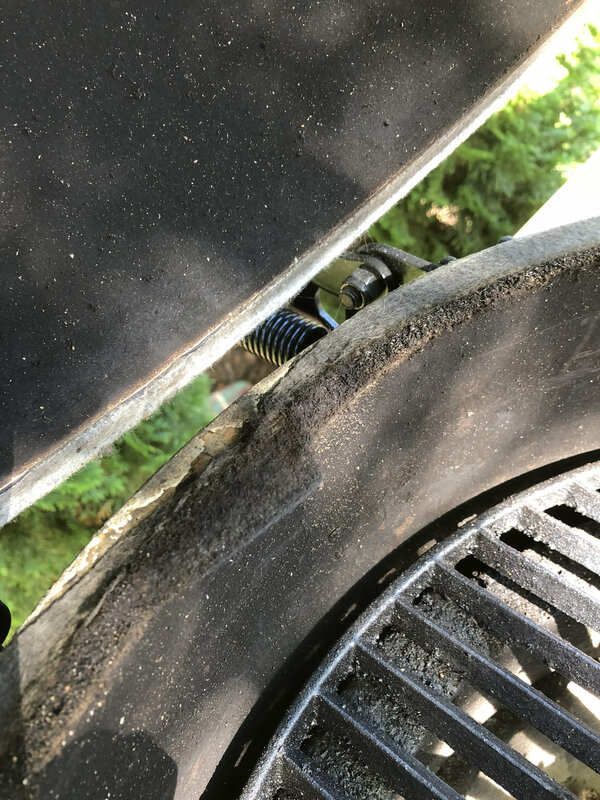 Assuming your band is the old style then the problems you described of smashing in the back (as obvious by the condition of the gasket there) and not closing in the front both point to the same problem. That is the planes of your dome and base are out of whack! Typically all you need to do is loosen the bolts and nuts on both bands enough so that you can force the dome down so the planes are the same. Then retighten. That will cure some of the underbite, but a small amount of underbite and overbite on eggs is not at all uncommon. The bases and domes are made separate of each other and slight variances can occur before they are fired. It's not like the egg was made together and then cut apart. The marriage of the two pieces happens when being packaged for shipping. Thanks Ron. I'll do some adjustment this weekend. Ask your dealer to get you a set of the new bands under warranty. They are much easier to align and stay in alignment. I had similar problems for 3 years....new bands have been great. You give up some dome opening height, but hasn't been an issue. I have the new style hinges. Still have the same underbite. Adjusted 5-6 times already. Not getting better. Always slides back to underbite position. Any other thoughts? This happens to me when I attack springs. Very annoying. Can’t seem to get it right.